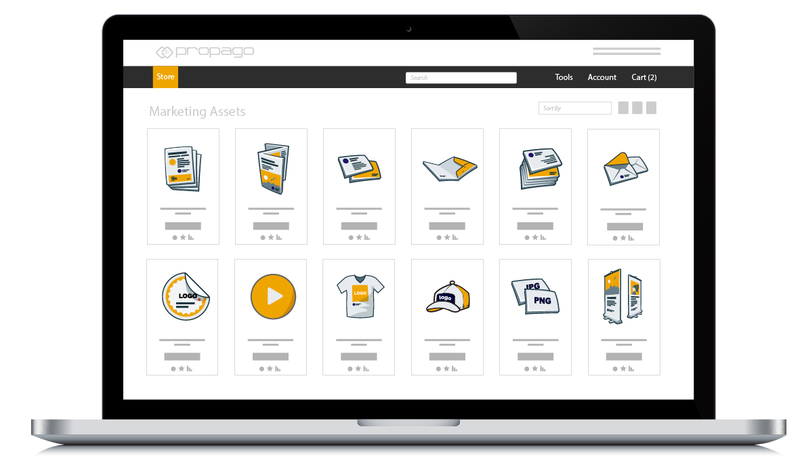 Propago Allows Print Producers, Enterprises and Marketers To Better Manage, Personalize, Produce, and Distribute Their Marketing Assets. The Most Intelligent Marketing Asset Management Hub. Bring print ready files, personalizable templates (VDP), direct mail, promotional products, apparel, digital files or any other marketing asset under a cloud storefront that protects the brand, budget and inventory while providing end users the most elegant ordering experience. Propago's Marketing Asset Management Platform allows producers and enterprises (brands) to bring any marketing asset under an intelligent marketing hub that enforces advanced business rules and offers an intuitive user experience that works for anyone on any device. Sales teams, affiliates, franchisees, channel partners and any other authorized users can access assets, order what they need, when they need it from anywhere they go. But, Propago doesn’t stop there! With a comprehensive set of web-to-print, production, procurement, warehousing and fulfillment tools, the platform ensures organizations have a streamlined supply chain from start to finish. Regardless of how many vendors/producers are needed to fulfill demand, Propago automates the entire process. Manage, personalize and distribute marketing materials. Control what can be personalized and what can't. Bring all and any of your marketing products under an intelligent online repository. 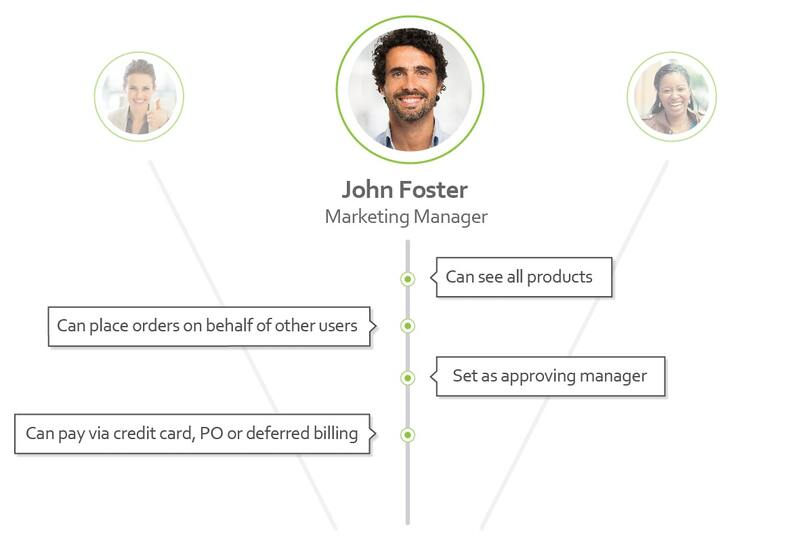 Allow partners to order and personalize marketing assets while you keep total control of the brand. Ensure sales has the necessary marketing assets to optimize every interaction with buyers. Propago has the sophistication that other marketing asset management solutions did not offer making it easy to differentiate us from print competitors. We tried other platforms similar to Propago but none of them could compare to Propago’s superior features, great technology, and awesome support. Propago’s marketing portals ensure all of your marketing assets are available 24x7 to those in charge of promoting your brand. You control every aspect of your end users experience. Control which products they can view, the pricing they see, if they can see inventory and much more. Putting users in groups allows you to easily manage your storefront regardless if you have 10 or 10,000 end users. Whether you are controlling volume on dollar amounts, order quantities, time-based limits, product limits or really almost any other scenario Propago is the platform for you. We understand the world isn’t as simple as “let’s require approval for anything over $50,” and have designed features to be flexible for your processes. The Propago platform can be your single centralized repository for anything related to your brand. You control what your brand gets put on, who can access it, who can order it, what can be personalized and much more. Better yet you have a single platform to be able to audit and trace where your branded products are going. If your user base can order a pair of flip flops from Amazon then they can easily order from the Propago marketing portal. We are compelled to keep all of the complexity of the platform behind the scenes so your end users just have to worry about promoting your brand. Much like our budget enforcement, the platform provides the ability to trigger approval processes in numerous ways. Our goal is to provide a platform to give you the approval and oversight controls you need to fit into your processes and not be limited with a singular setting. There are so many different ways marketing departments allow for personalized marketing communications. Instead of trying to drive creative professionals to a single design method we decided to build a platform that would allow the creators to create. The Propago platform handles anything from template based personalization, to free editing of collateral, to straight uploads of whatever your users wish. Naturally, you are in complete control on what you allow your users to do. Originate and execute mailing campaigns directly from your marketing portals. Regardless if you are bringing a mailing list to the system, ordering a contact list through Propago or using a corporate populated list of leads. In the world today, it may not be as simple as Jane needs to approve John’s orders. Maybe John’s orders need to be approved by Jane and Jo. Maybe John only needs approval from Jane when he orders Gizmo A. Maybe John can do whatever he wants as long as it doesn’t cost more than $500 per month. It’s not up to us to tell you how your approvals should flow, it’s our job to provide a platform that supports it. From requiring purchase orders or credit cards, to providing store credits or promotional codes the Propago platform has you covered. You may decide your sales representatives can order in unlimited quantities but your accounting personnel only get $500 a year in store credits. Propago has you covered. Propago is delivered to you via a SaaS model. There is nothing for you to install, no hardware you need buy, and you never need to worry about updating the platform. We handle everything for you. You don’t need to have a BS in Computer Science to figure out our platform. Administer and configure every aspect of the system through a standard web browser using an intuitive interface. No developers required (unless you want to get really fancy with our API set). Web-To-Print 5.0 ...2.0 just isn’t enough! Web2Print is a feature of the platform but doesn’t define us. We break the mold of the traditional W2P systems by: 1. Handling ANY product elegantly (print, promo, wearable, gizmo or digital) and 2. Having the “backend” tools in place to handle it in ONE platform. Doesn’t matter what kind of method you are using the platform can handle it. JIT, inventory pulls, drop shipping, Print on Demand, kitting, combination of all, no problem. From a simple business card to a multipart promotional kit, Propago handles production better, regardless of volume and complexity. We understand that not everything you offer is readily available in the warehouse or to be produced. The Propago platform has a complete procurement workflow that easily consolidates and organizes demand for a simple procurement process. Propago features a complete embedded warehouse management system (WMS). This feature handles all of your warehouse locations, production locations, pick and pack, and much more. Know in real time how much inventory you have, exactly where it is and the demand against that inventory. The system will automagically prioritize, optimize, consolidate and batch orders, maximizing productivity, increasing throughput and reducing turnaround. Imagine being able to pick, pack, and ship 500 orders in 30 minutes as opposed to 5 hours. Information is power and with Propago you have it at your beckoning call. With a full set of visual dashboards, stock reports and the ability to perform ad-hoc reporting you won’t have to worry about being able to see exactly what is going on. We could talk for hours on all the features that come with Propago. You can click here for a more complete feature set but the biggest bang for your buck would be to reach out to one of our specialists to tailor a demo based on your needs. Contact us today to have a specialist cut to the chase.